Trading in four 19th century houses in Paoli for a new multi-story apartment building … is this progress? 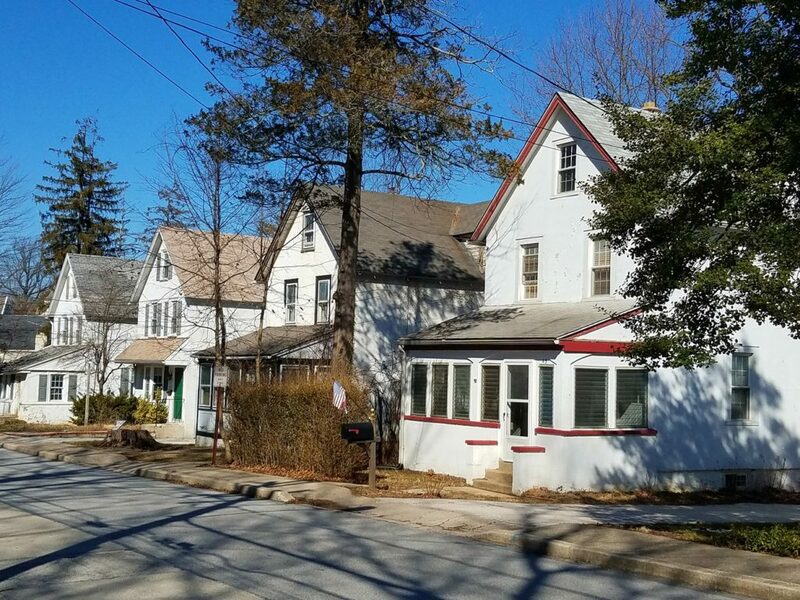 If a developer in Tredyffrin has his way, we are going to lose four historic houses in Paoli to make way for a multi-story apartment building! Developer Lancaster Chestnut LLP presented a preliminary land development plan LD-03-2016 “Chestnut Road Apartments” at the Planning Commission. The application seeks to consolidate four parcels into one parcel for the development of a multi-story, 17 unit apartment building with 1 and 2-bedroom units. 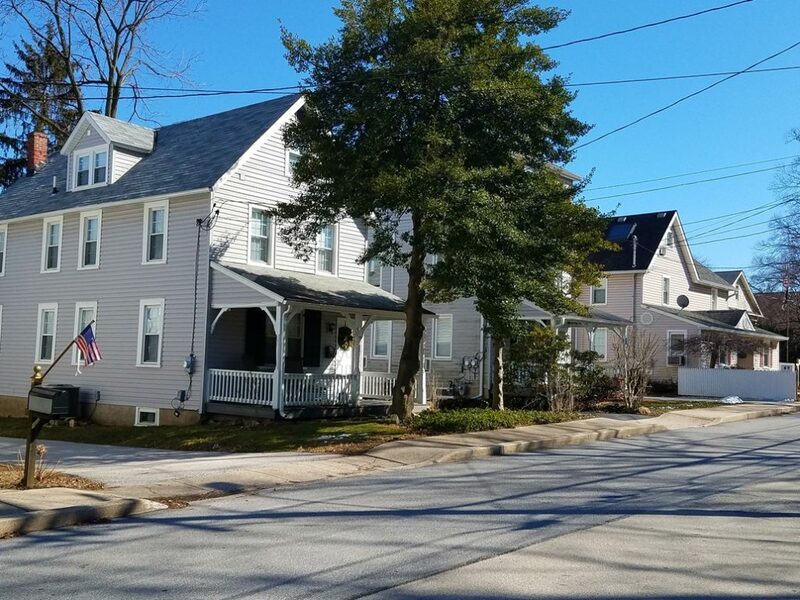 The site for the proposed apartment building is Chestnut Road, south of Lancaster Avenue and is located within Paoli’s TCD (Town Center) district. Demolishing four 19th century homes to ‘make way’ for a new apartment building was not volunteered by the developer – but rather as response to a Planning Commissioner question regarding the age of the buildings. I visited Chestnut Road to see where see the location of this proposed apartment building. Assuming the land development plan moves forward, the four historic houses slated for demolition are 35, 37, 39 and 43 Chestnut Road. Driving past these four houses on Chestnut Road, there are three additional houses which are restored and occupied. Sadly, these are the four “Seven Sisters” houses on Chestnut Road slated for demolition to make way for a multi-story apartment building. Dating to 1895, these three “sisters” houses are restored and occupied. With the Chestnut Road Apartment plan, these 19th century buildings will lose their four “sisters” and live in the shadows of a 21st century multi-story apartment building. Close-up of Colonial Revival cottage, c.1895 house on Chestnut Road that will come down for the proposed new apartment building. The four houses to be demolished are individually included in the 2003 Tredyffrin Township Historic Resource Survey book. For the township’s survey, the houses were surveyed and photographed. The historic consultant described their architectural style as “gable-end Colonial Revival cottage” and dated the properties to 1895. Through local history, the neighborhood of the seven 19th century homes on the east side of Chestnut Road was known as Paoli’s “Seven Sisters”. Now one hundred and twenty-two years later and four of the ‘sisters’ are on the brink of demolition. Single family homes of the 19th century to be replaced by 21st century multi-family apartment building. Destruction of local history in the name of progress …? 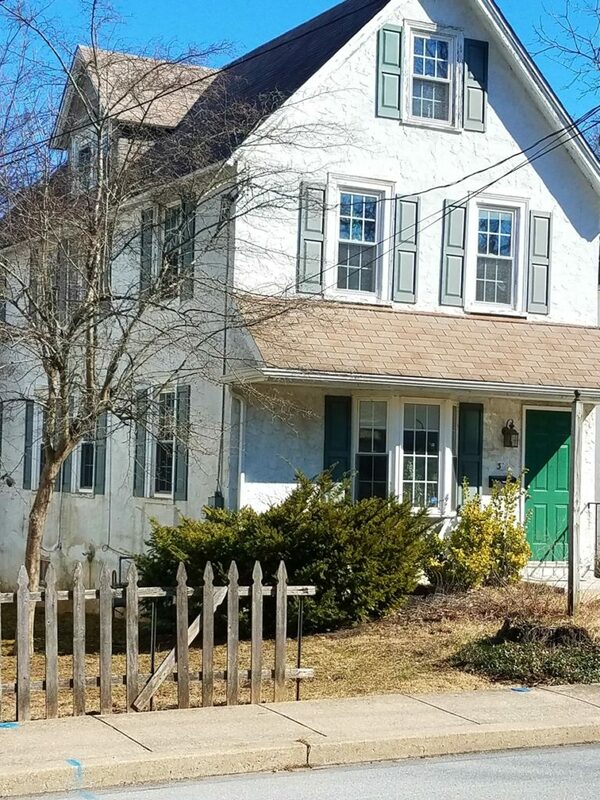 Although the four 19th century homes are included in the township’s historic resource book, the identification is meaningless as Tredyffrin remains a municipality without a historic preservation ordinance of protection. Without historic protection and the property’s inclusion in the Town Center zoning district, the proposed apartments are a permitted use. Chestnut Road Apartments will join the other new apartment plan in Paoli – Station Square on the corner of N. Valley and West Central. The proposed Howellville Road townhouse plan returned to the Planning Commission. No Tredyffrin resident spoke in favor of the project and several in the audience voiced opposition. TE School District board member Michele Burger raised concern about the multiple new townhouse projects in Tredyffrin and Easttown and the resulting increase in student enrollment. Neighbors spoke about the existing traffic issues on Howellville Road and the negative impact of this proposed townhouse on the community. Others, including myself, spoke of the historic significance of the village (and the old winding country road) and the changes the project will mean to the character of the area. The developer John Benson of Benson Company presented new plans that reduced the number of townhomes from 20 to 18 with a one-way horseshoe entrance and exit in addition to an interior alley. Township engineer Steve Burgo voiced storm water concerns (Crabby Creek runs through the property). These proposed townhouses should not be marketed as a downsizing option – we were told each unit is 3,000 sq. ft.! Visibly annoyed by the many questions and comments, the developer did not feel he had adequate direction on his proposed plan. If I had my way, the project would just disappear but that is unlikely as Mr. Benson made certain that we all know that his townhouse plan is a ‘by right’ use that he intends to pursue. However, there are required changes to his plan if it is to move forward. He certainly left the meeting with a lot to think about update if his plan was to move to the next step. Because our township zoning allows by-right density housing in many areas of the township, the developers will continue to bring their plans. C-1 (commercial) zoning now includes a townhouses as a by-right use, so what is to keep developers from demolishing office buildings and building more townhouses? Townhouses could be an economic boom for developers to redevelop vacant and/or aging office buildings. Beyond the destruction of local history in the name of progress, there are other concerns about multi-family development projects – rising student population in local schools, additional strain on our fire, EMS and police departments, increased traffic, etc. Please do not misunderstand; I support economic redevelopment if thoughtful and well-planned.